Members of the finance department at Erie Insurance won’t be found in their offices today plugging away at numbers. 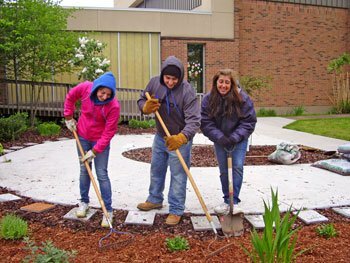 Instead, they are spending the chilly day outside the Barber National Institute spreading mulch, raking grass and clearing weeds to make room for more plants in the garden. 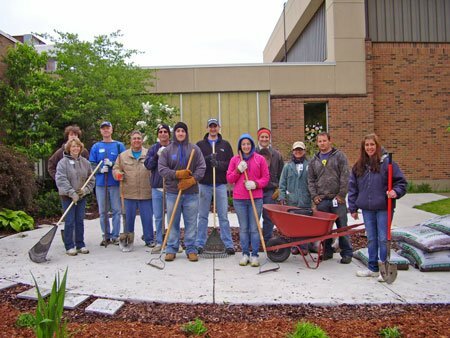 The volunteers visit the Institute twice a year, in addition to other local organizations, and help out as part of a community outreach initiative. Thank you to today’s volunteers who pitched in to help beautify and get the grounds surrounding the Institute ready for summer!